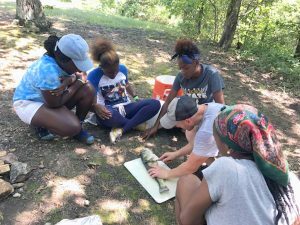 The mood at Teen-girls camp 2017 was ‘chill’ despite the extreme heat. As the temperatures climbed throughout the week, spirits remained high! Our first day with 38 girls was spent getting to know each other. After marking clothes, the pool provided a refreshing break. From the pool, the entire staff made the trek to the lake for a cookout and enjoyment of all the lake activities, including the battle barge and lake trampoline. The skit and chapel time messages were centered around our theme “REPRESENT.” The chapel teacher, Miss Ko, shared her testimony and touched the hearts of many girls. She did a great job of representing Christ to the girls. Tuesday night was the annual TG egg war! 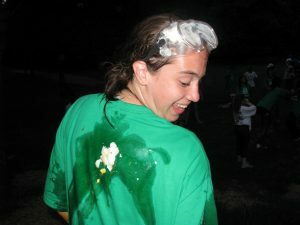 Staff and campers didn’t seem to mind the gooey mess too much! Everyday electives included options such as dance, trust activities, swim lessons and choir. 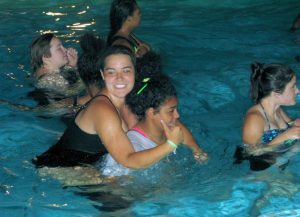 Circle time provides an intimate small group time for campers to go deeper with an encouraging staff member. During free swim time the Opportunity Farm guys provided large ice blocks that were placed in the lukewarm pool . It was amazing how fast that block melted with ten or more girls trying to sit on it and push it to the bottom of the pool! Also, unique to TG is the late night swim and ice cream floats. It was a time to relax after a long day and slow down enough for evening devotions and bedtime. 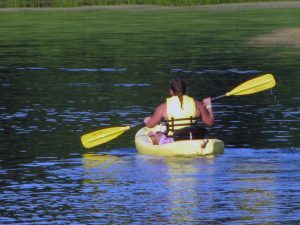 At TG, campers are able to choose optional activities individually. They either picked their favorites or opted to try something new. Some of the activities chosen this week were archery, camp out, climbing wall, fishing, and of course S’mores. 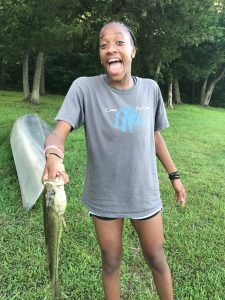 Several girls chose to fish and were led by the infamous Mr. Jon. They caught some really big fish and the next day cleaned them and cooked them over an open fire. It was the highlight of their week. During the afternoon the craft hall becomes a hangout where the girl can be creative, do nails, or just talk. Getting ready for the Friday night banquet takes most of the afternoon. There are stations set up for hair, nails, and makeup. The girls love dressing up and feeling as beautiful on the outside as they are on the inside. The actual banquet meal of fried chicken, mashed potatoes and all the fixins’ is served by the guys on staff and the girls are treated like the young ladies they are. Chapel on the last night includes showcasing dances, the choir and spoken word which the girls have practiced all week. The 16 year old girls have the opportunity to share what camp has meant to them. Their testimonies always include tears but we hope to have many of them come back as staff next year! The only word to describe what happens in Friday night’s chapel is JOY!